So You Want Straight Teeth? Here at our Charlotte NC dentist’s office, we offer all of these options for cosmetic dentistry. The option that many choose for correcting crooked teeth, though, is that of Porcelain Veneers. Also known as Laminate Veneers, these are very thin porcelain shells, individually hand-crafted by a skilled laboratory technician, that are bonded onto the teeth. There must be clear and excellent communication between the patient, the dentist, and the laboratory, for veneers can truly be customized to create the look that you want: Shape/Contour, Translucency, Color, Brightness…..
Veneers single biggest advantage over Braces is the speed with which a smile makeover can be completed. Unless there are complicating factors, a Smile Makeover can be completed with veneers in only 3-4 weeks. Of course, the disadvantages are that usually some healthy tooth structure must be removed, and they’re more expensive. 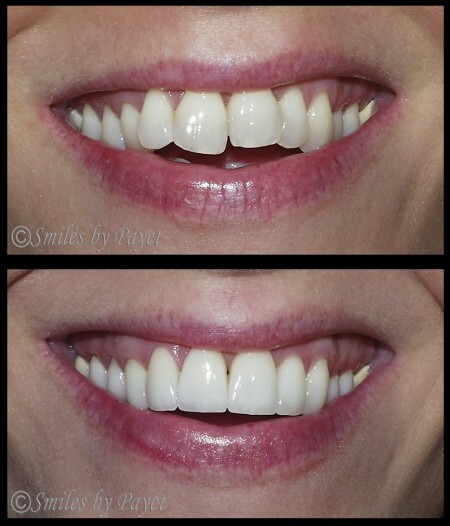 For more examples of cosmetic dentistry using porcelain veneers, please see our Before-and-After Gallery!